It was a good day for the host club as Yared Hagos and Stacey Rogers won the inaugural Terry O'Gara 5K Memorial Road Race, promoted by Wallsend Harriers. The race was the brainchild of the club's former Chairman, Terry O'Gara, who wanted a fast road race to replace the multi terrain race that they used to organise. Sadly, Terry passed away a few months later, less than 2 months after representing England at a Masters Cross Country International and the day was always going to be an emotional one for organisers and marshalls alike. The course, which consisted of one large and one small lap finished at the historic Segadunum Museum and after a steady start, Hagos hit the front and was never headed. It was only last week that Hagos ran 2.19 at the Brighton Marathon and although still feeling the effects he still wanted to compete as it was Terry who played a big part in helping him settle into the area. His winning time of 14.49 was 44 seconds ahead of Leeds City's Carl Smith who continued his good form after gaining a silver medal at last week's National 12 Stage Road Relays. In what was a very strong veterans competition, North Shields Poly's Guy Bracken, now in the V50 category, was victorious against his younger rivals, placing 5th overall in 16.18. 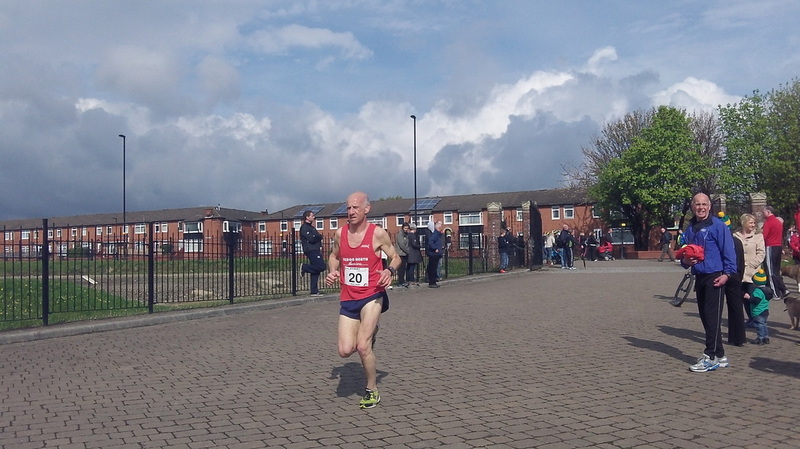 There was a fantastic battle for 2nd as Tyne Bridge Harriers' Scottish International Kenny MacPherson powered away from rivals Gary Moore (North Shields) and Brian Hetherington (Wallsend) in the final stages, only 7 seconds seperating the 3 at the finish line. All three went under then 17 minute mark which is a brilliant running. This time last year, Stacey Rogers was running a PB of 2.53 at the London Marathon and while this year she was unable to return after missing too much training through injury, she still showed that she has enough background to pull out a great performance. Her 18.12 equalled her PB and placed her 33rd overall as she won by half a minute from clubmate Vicky Hindson. Joanne Lee from Tynedale was a clear winner of the veteran ladies section is a great time of 19.05. All in all a good days racing on what was quite a tough course. Well done to everyone that supported the club and paid their respects to one of the most popular characters on the North East running scene. Please see below for some pictures from the morning. More pictures can be found at the Runners Wanderings website by clicking here. North East Runner would like to thank Alistair MacDonald for use of his pictures. Here at North East Runner we try to get to as may local races as possible. If we are there we will report! Click here to read about the races we have attended then visit our Race Reports.